Posted August 10, 2018 & filed under News. Whether learning a language, mastering a sport or gathering gobs of greenbacks, starting young is always a plus. It’s also crucial to get into good habits early, before hard-to-break bad ones are cast in concrete. A perfect example: Start a lifetime of saving and borrowing at a credit union, which may cater to young adults better than a bank can. “A great concern for people just entering the workforce is the stagnant nature of wages and benefits, so it makes sense to look at opportunities to reduce costs and receive higher rewards,” says Marco Pantoja, interim director of the University of Missouri Office for Financial Success in Columbia, Missouri. Here are 4 reasons millennials should consider a credit union. 1. You may get a better deal on a savings account or certificate of deposit. This fall, the average 5-year CD paid 0.85% APY, Bankrate’s survey of banks and thrifts found. Credit unions, on average, paid 1.55% APY, according to the National Association of Federal Credit Unions. 2. It may be cheaper to borrow from a credit union. “When borrowing, one of the major needs for which people use financial institutions, credit unions have lower rates and lower fees,” Pantoja says. 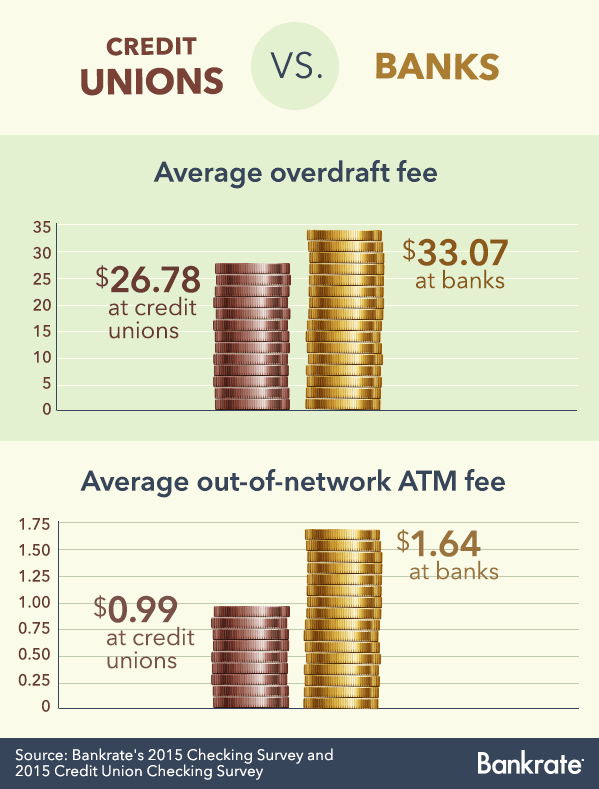 3. Credit unions may charge less painful fees on accounts. Bankrate’s 2015 Checking Survey found just 37% of banks offer free checking with no strings attached. A separate 2015 Bankrate survey found 72% of the nation’s 50 largest credit unions offer free checking accounts. Perhaps the biggest upside of credit unions is they are owned by their members. Their nonprofit status allows credit unions to return revenues back into services or reduced costs for members. Don’t be put off by the term “members.” A big misconception about credit unions is that they are highly restrictive or exclusive in granting membership. Credit unions have requirements for membership, but they differ widely and can be surprisingly broad, Pantoja says. A credit union may require members to be part of its community, or of a particular church or employee group, Pantoja says. Educational institutions also have credit unions. Finding a credit union is as easy as a visit to the Web. Visit the Credit Union National Association’s ASmarterChoice.org or the National Credit Union Association’s MyCreditUnion.gov, which will list nearby credit unions based on a consumer’s street address.